With everything that has been in the news recently regarding plastic and pollution, there are steps that we can take to help try and prevent further plastic pollution. Making the change from plastic to paper or compostable straws is a good start. Some establishments have banned straws altogether but what about introducing a compostable straw? It looks similar to the plastic straw but is fully compostable meaning it is made of a biodegradable material which breaks down under composting conditions within a given time scale. Alternatively, why not go back to paper straws or try the edible straws instead. Takeaway coffee cups have also been in the news recently. Some of these cups are hard to recycle due to the lining that is used, but there are alternative takeaway cups available that are 100% compostable and will still keep your hot drink hot! As artisan food markets and food festivals get more popular people are looking for sustainable packaging as well as great food. In a growing and competitive marketplace your products need to stand out from the rest. As well as providing tasty food, environmentally friendly and attractive disposable packaging is also crucial. 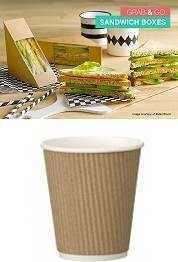 Cardboard trays, compostable cups and plates and bespoke printed wrappers can all help to bring the final product together. It’s not just packaging that needs to be environmentally friendly, consumers are becoming more aware of how the use and manufacture of cleaning products can impact the environment. Evans Vanodine use their own unique, innovative system for classifying their products according to their environmental impact. To help achieve the objective of optimum performance with a minimal effect on the environment, Evans have introduced a unique, innovative system for classifying their products according to their environmental impact. Each product is analysed in order to produce a score. The lower the overall score, the lower the impact it has on the environment. Products with a low impact rating are identified by a green tick logo on the label. 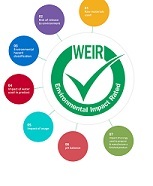 For further information, please click on the W.E.I.R logo. Evans Vanodine also use plastic containers which are easily and commonly recycled. The plastic trigger sprays for the trigger spray bottles are also 100% recyclable. We are working towards our ISO14001 Environmental Management System and as a company, we are striving to work with suppliers that are environmentally aware and source products that will help reduce the amount of plastic waste that is produced. 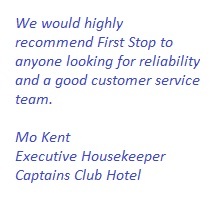 If you would like any further information, please contact our sales team who will be happy to help.